Any to PDF, DOC, TIFF, XPS Server-side. Any to PDF, DOC, TIFF, XPS. Server version. 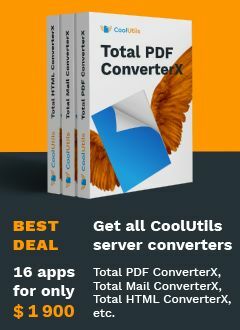 Coolutils ConverterX is the server-side solution to convert any file to PDF, TIFF, DOC or XPS. Should you work with different file types, you'd love the app that can turn them all into one. Coolutils ConverterX has no GUI, no interrupting messages. It run quitely on your server and produces accurate PDF/DPC/TIFF/XPS files. Any file to PDF; any file to TIFF; any file to DOC; any file to XPS. Input file types include PDF, EPS, XPS, PCL, HTML, XHTML, MHT, DOC, TXT, RTF, DOCX, DOCM, XLS, XLSM, XLSX, XLT, ODT, ODS, TIFF, PNG, JPG, BMP, GIF, emails (MSG and EML files). Customize your output files: add page counters, dates, confidential notes, your company's name or logo. Set user permissions and password-protect PDF files. 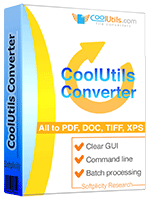 CoolUtils ConverterX is a great solution for turning any file types to one standard. Install one copy on your sever and your employees will be able to use it. Make Coolutils ConverterX a part of your app with a few lines of code. Coolutils ConverterX saves your time. You don't have to run several apps to process different files; you can rely on one. Try the free evaluation copy today, bulk convert your files to PDF/DOC/TIFF/XPS. "Thank you for Coolutils ConvetrerX. It handles karge bulk jobs on our server and we are happy with the perfirmance." "I use Coolutils ConverterX to convert PDF, DOC file and JPG scans into PDF/A for our electronic document system. From the customer's standpoint it's pretty intuitive."